How to and what to track on Social Media – on Facebook, Instagram and Twitter is really about reaching the right people at the right time – and engage them successfully. 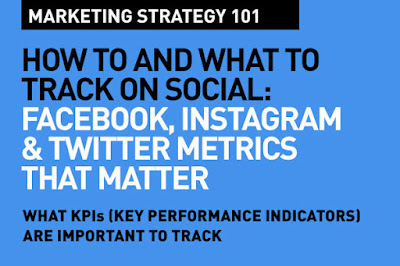 Many social media marketers are confused about what to track – and why, and how. Follower counts really do not matter. They're good for the ego, but they really mean very little. In a report done by Forrester, we learn that businesses have an engagement rate of less than 0.2%. Instagram was the only exception to that statistic. Imagine, if you have 100,000 followers. This means, that actually only 200 people have some sort of interaction with your post. I would rather have just 10,000 followers and 2%. Same 200! Your first step is to do a complete audit of your social media. What works? Which posts deliver better engagement? Which ones fall flat? Are you talking to the right people? Do you know your target audience? Your customers? Your social media is really about delivering to them, engaging them. Customer Insights is your First Step in Digital Marketing. Facebook offers some really useful insights on performance. Log in as a manager of the page and look for the Insights tab. Facebook provides a very useful dashboard of the key metrics you need to track. The two critical ones are Post Engagements – the number of times people have liked, commented on, and shared your posts; and Actions on Page – how many times have people clicked on your Call toAction. Of course, you can check out Page Views, Page Likes and Reach, but if you've got no engagement, these mean nothing. Your most important KPI (Key Performance Indicator) is to push towards increasing post engagement. A quick way is to go through all your posts and identify the ones that did well on Engagement. Try and replicate what you did there. Facebook actually shows engagement metrics by category – Video, Photo, Status or Link posts. Here, it also tells you, that may be your video posts are doing really well, and your Link posts are not. It's also important to have benchmarks. Check out how your competitors are doing. Facebook provides engagement performance for any other pages you choose to watch. This should also help you set some goals. You'll also see which posts perform for them – giving you ideas for your content and format. A way to track conversion from Facebook is to track Actions on Page. The report shows you who clicked on links on your page – to your website, for example. You can track by device, location, gender and age. If you look at Page Views and then hold that against Actions, you'll get a conversion rate. Engagement on Instagram is measured in Likes and Comments. Links within posts are not allowed. Actually, you can have a link, say to your website, but it has to be in the bio. A neat way to track 'Instagram conversions' is to have a custom landing page on your website – only for Instagram traffic. As well, it's best to use a custom trackable link like Bit.ly (I swear by this), or Google's Campaign URL Builder. So, what do you track on Instagram? 1. A simple one is average Engagement Per Post. Add up your Likes and Comments and divide the sum by the number of posts. Track this over short periods – like a week or month to keep this metric current. 2. Track Engagement as a percentage of your total population of followers. Take your total engagement (Likes + Comments) and divide by your total followers. Does your growth rate reflect how often you post? What about the types of photos you posted over the last period you measure? 4. Track traffic from the URL in your bio. This literally tracks conversion. Follower locations is important – it tells you where your key markets are, and helps you time your posts. You should also see when your followers are active and which posts are working with your audience. This way you can optimize what and when you do on Instagram. Twitter provides some interesting metrics in the Analytics dashboard. On the Home tab, you can track performance numbers for the last 28 days, as well as your top tweets. You can track how well you are able to engage your audience with your tweets – there's a list of your recent tweets with numbers on impressions, engagements, and engagement rates. Impressions – really don't matter, because it counts the number of people who have seen your tweet – but that doesn't mean they haven't just scrolled past them. Enagement is the key metric. Engagement is when when people actually click on, favorite, retweet, or reply to your tweets. A 28-day average compared to the best performers help you find out what went right. You need to try and increase your engagement rates. That's a great KPI for twitter. Check which tweets did well, and replicate what went right. Also check engagement against time of day or day of week. Build a post schedule based on this insight. Audiences matter. You can go to the Audiences tab to know more about your followers. You can see a breakdown by interests, buying style, household income, and net worth. The interest data, for example, helps you define where you should focus on for your topics. Afterall, reaching the right people is key. Many marketers track a lot more information using tools and dashboards, and then combine them to track overall social performance. The above are the absolutely critical ones you track – without having to spend a lot of money on paid-for analytics. By the way, I also recommend tweetreach which is pretty cool for analyzing twitter performance. Dead easy to follow tips on Social Media metrics to track. Wish there were tips on Snapchat. Thank you for the TweetReach by Union Metrics shoutout. We appreciate it! This has made a lot of progress in very short time of period. Generally the person who is setting up a new traditional business does not get the profit and customers early or easily. But the business like for Medical Marketing which is done online gets the profit along with high rate of customers. Thus advertising the business through digital marketing or promoting it is one of the correct or we can say it counts to be the supreme decision. I am happy about your blog. Thanks admin for sharing the unique content, you have done a great job I appreciate your effort and I hope you will get more positive comments from the web users. Everything is fine. I am happy about your blog. Thanks admin for sharing the unique content, you have done a great job I appreciate your effort and I hope you will get more positive comments from the web users. great activities are conducting to students. this makes some relieving to them technical studies. i wish to follow and conduct those kind of activities you are mentioning. keep share. I am really searching for this kind of information, as well as i came to know many things. so please update the latest information, it may be useful for me like beginners. Such a great articles in my carrier. Thanks so much!!!! there have very informative blog for acknowledge with track on Social Media – on Facebook, Instagram and Twitter conduct those kind of activities you are mentioning. keep share. This post is really nice and pretty well maintained, thanks for it and keep updating you posts. If you look at Page Views and then hold that against Actions, you'll get a conversion rate. Thanks for your great tips. Is there anyone want to Buy Twitter Followers? We can help!